This book focuses on the role of the psychiatric, medical, nutritional and psychiatric assessment and management of severely ill patients with anorexia nervosa. Leading clinicians and researchers address the essentials of risk assessment, the identification of complications and the monitoring of treatment progress. Location of care and the role of the team are fully addressed, with due consideration of legal and ethical issues. Practical guidelines are included on risk assessment, management of acute and chronic physical problems, feeding during treatment and consent, as outlined in the MARSIPAN (2010) and Junior MARSIPAN (2012) documents. 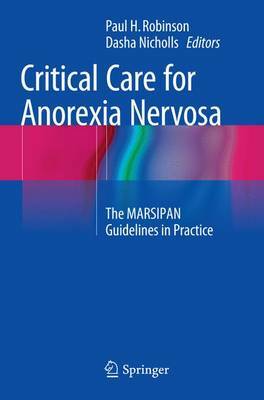 Critical Care for Anorexia Nervosa will be of value for medical and paediatric teams, GPs, psychiatrists and all health-care professionals involved in the treatment of acutely ill patients with anorexia nervosa.